john4jack (Corvallis, Oregon, United States) on 7 September 2009 in Business & Industry and Portfolio. On the way back to Corvallis, we took a super winding Oregon backroad past a lumber mill that had an old teepee burner at its entrance. In November, our photo arts guild is presenting a big photography exhibit on the theme "An Oregon Journey in B+W: Along Rivers, Roads and Rails." It's in part a celebration of Oregon's 150th anniversary. This photograph may be one of my offerings. Beautiful shot!!! Love the 'old postcard' feel about this shot! Amazing color tonnes and framing... Very well captured!! Love that scene and composition. It would look great in IR I think. @Nicholas: I'll go back and try out a fake IR preset on it. This image is magical, surely just right to enter for the show. That old burner is lovely, and the texture and tones you've used to portray it perfectly express the image and mood!!! One of my favorites of your work! P.S. I'm just starting to think about trying to print some images, so I really appreciated the info you shared. @Dulcie: Thanks, Dulcie. I love printing almost as much as shooting. The feel of different papers is quite sensual. This is such a lovely shot...the colour is great. I think it will be my shot of the day! Now and Then. A great tribute to a glorious past. A really powerful timeless shot with this perfect PP of yours. @zOOm: Merci, Florence. Timber was a major industry in the Pacific Northwest. The light is beautiful and the colors too! Great post processing ! Love this subtle tones ! I really like your processing on this, Jack; it's perfect for the arts guild! Wonderfully shot Jack, and your processin on this one is superb!!! This shot will fit in perfectly with the photo arts guild exhibition.....I would definitely enter it!!! Wonderful processing on this - an old feel to it for sure. It's a fine, historic image that should be an excellent candidate for the exhibit. I like the processing and the toning very much. Very nice shot. A strange image beautifully composed! tone gives it an air of drama and it's a beautiful effect! Love this processing. Very nice. nice sepia ,jack ,i like this framing ,and the mystery of the batiment ! A weird building and an interesting choice of tonality. So beautiful, Jack. And so interesting - what exactly is a teepee burner? @Sarah: Teepee refers to the shape (like a Native American teepee). Lumber mills used to burn huge amounts of sawdust in them. I love the tones. An interesting image very well presented. I never saw such a large teepee, please tell me more about the use for this building. Fabulous! What an interesting and impressive structure! An offering that I'm sure will be well received. Superb job Jack. A great photo to be made part of the exhibit. Not certain I have seen such a structure before. Thanks for sharing and the accommodating narrative. This photo would be great for the exhibit, it's so nostalgic and the color toning ads to that atmosphere. very nice capture. beautiful edit. a wonderful shot, very deserving for inclusion in the exhibit! brilliant processing!! love this mystical, vintage style! Superb! The processing makes this so vintage. Ideal entry for the exhibit. Very interesting place. @Barbara: Most of my shots were of the lumber mill, but this one that took in both the burner and a small portion of the mill seemed to better fulfill the theme of the upcoming show. 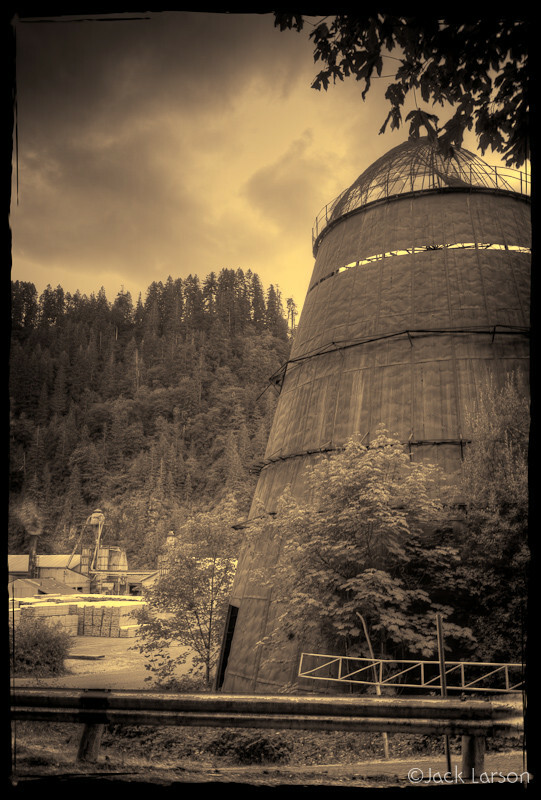 Love historical area and shots...nice find here my friend...never seen on of those type of wood mills..lovely tones.